I recently had the privilege of speaking with Jean Lewis, founder of Medicare for Autism Now!, and producer of the exciting film, Medicare’s Orphans, to be released in October 26th, 2011. In this 20 minute interview, Jean gives us the story behind the story, and delivers insight into the plight of children with autism in Canada. This is a story well worth following! ege of speaking with Jason Eden, the author of Staging a Miracle: A Practical Parent’s Guide to Surviving an Autism Diagnosis. In this interview, Jason discusses his journey from diagnosis to treatment and ultimate success with his son. He offers much valuable advice to parents of newly diagnosed children, as well as those advocating for their children in the school system. From the shock of diagnosis, the search for treatment, the logistics of setting up and administering a treatment program, to the advocacy responsibilities, if you are a parent at the very beginning of the process, think about this book as a shield of armor to protect you against whatever may come your way. Enjoy! 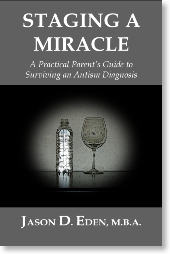 Staging a Miracle: A Practical Parent’s Guide To Surviving an Autism Diagnosis, by Jason Eden, is a hard-hitting book I came across quite by accident. It has been many years since my child was diagnosed with autism so I don’t generally read books on this topic; however, part of the title “surviving an autism diagnosis” piqued my interest. The author, Jason Eden, writes in a blunt, brutally honest tone which is clearly designed to save the parent of a newly diagnosed child time, since, as we all know, the clock for early intensive behavioral treatment starts ticking upon diagnosis. Eden dishes out “tough love” to the new parent, but then he shows his true colors when he says: “This will not be an easy journey, but that was guaranteed from the moment you first suspected there might be something different about your child. Let’s walk through this together, and let me help you set the stage for your own personal miracle”. Here’s a dad, laying it bare for all the world to see, in order to help his brethren, other parents of children with autism. The reader will appreciate Eden’s candor. 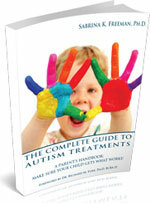 The author also includes a chapter on how to prepare advocacy for your child and actually discusses his various techniques in detail! This chapter is very valuable because, so often, parents of children with autism do not understand that it is not their requirements that are unreasonable, and it is not their child who is creating the problem; rather, it is the system that does not adequately accommodate the child. In other words, the parent of a child with autism is not unreasonable despite the picture often painted by the “professionals” in the educational system. Another important chapter discusses housing, and how to make sure that you are not discriminated against when renting a home (in his case, he changed school districts to be in a more autism friendly district). This is a valuable discussion to have since many parents are so concerned with the more pressing, immediate issues that they may not even realize that they are unwittingly sabotaging themselves and adding to the difficulty of finding appropriate housing. From the shock of diagnosis, the search for treatment, the logistics of setting up and administering a treatment program, to the advocacy responsibilities, if you are a parent at the very beginning of the process, think about this book as a shield of armor to protect you against whatever may come your way.